Maria Laroco shares the heartbreak she felt when she first got eliminated from Team Lea in 2014. After making an exciting debut performance in X Factor UK which ended up with a standing ovation from the judges, contestant Maria Laroco said her experience in The Voice Philippines in 2014 was partly to thank for preparing her for the international stage. “The Voice Kids taught me to always do my best. Because the last time...siguro ‘yun din ‘yung mistake ko, but I actually did my very best still sa competition na iyon, but it taught me not to give up on my dreams and to always do my best. Like it’s my last performance ever,” she said. 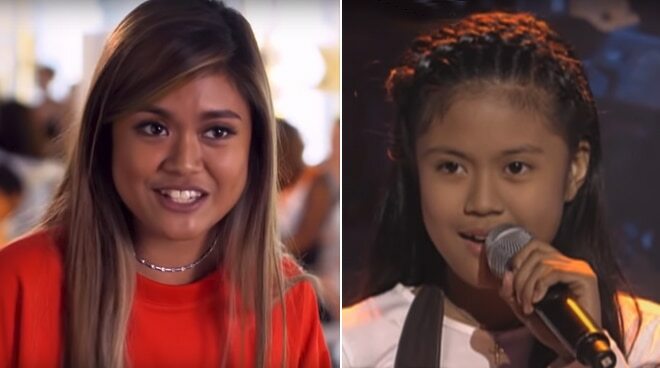 The 17-year-old singer said it was tough not making the cut as part of Lea Salonga’s team four years ago (where she performed under the name Giedie Laroco) but it inspired her to do even better in her next singing competition. “When I got eliminated from The Voice Kids, it was heartbreaking, I was devastated, pero sabi ko naman it’s okay, maybe it’s not my time yet. Through that experience, nag-aral pa ako mabuti sa singing ko, and then nag-train para maging better. And sa next time na sali ko, sana mapalaran ko na ang manalo,” she said. After The Voice Kids, Maria said she never stopped reaching for her dreams in singing. “It was 2014, I joined a contest as well this year lang sa kabilang network. After The Voice Kids, nag-focus muna ako sa studies ko, sa school, and then guestings, tapos mga mini concerts sa province namin. Na-train ako lalo sa mga ginagawa kong guestings. Dahil doon, na-enhance ko pa more ‘yung talent ko. I’m so happy kasi nakaka-inspire ako ng mga teenagers na katulad ko hindi sila mahiya sa mga talent nila, i-show lang nila sa buong mundo what they can do,” she shared. Now that she is on X Factor UK, Maria said she will give it her best after a long journey to get there which included three attempts to make it past the online auditions before being allowed to fly to London and do a live audition in front of the judges. “My experience during the audition of the X Factor was overwhelming. I found it quite surreal because I was just dreaming of that moment and finally I was there, singing in front of all the people. All the British people. And of course, in front of Simon Cowell. It was so unbelievable for me because I’ve always wanted to be here. I’ve always wanted to stand in front of them and perform. I couldn’t actually place the words for it because I’m just so happy to be given that chance to perform,” she said.